Search engine marketers know how important it is to think about the words that they don’t want their company or brands to be associated with. But few people apply the same keyword rigour when posting to social networks. In this post, I’ll explain why this is important and how you can turn negative keywords into big positives for your business. First up, what is a negative keyword? A negative keyword is any word or phrase that you do not want to associate with your business. Let’s imagine we’re running a hotel, Frost Mansion, that offers luxury spa retreats for adults. Your guests pay handsomely to stay at your hotel because they enjoy the calm, child-free environment, together with likeminded grown-ups. It’s pretty clear that you don’t want your hotel to attract groups of children. In fact the last thing you want is a family with kids turning up with a reservation ready to destroy the peace and tranquillity. 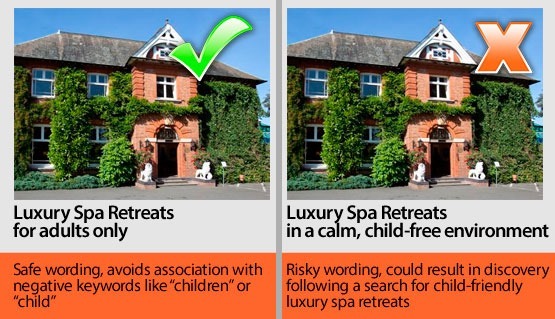 Unwittingly, the inclusion of the word ‘child’ in the second example could, in some circumstances, lead to your hotel becoming discovered by someone searching for luxury spa retreats with children. And while the major search engines are getting better at understanding the semantic meaning of phrases like “child-free”, until they perfect this there’s a risk that even a mention of a negative keyword could have the opposite to the intended effect. The first tweet will show up in searches for ‘weekend hotel offer children’, potentially attracting the wrong type of clientele. And don;t think that including the phrase “sorry no children” will work all the time; people scan online content and routinely gloss over important details like this. In contrast, the second tweet avoids this risk completely by excluding negative keywords relating to children. Refine your negatives list, removing duplicates and making sure you’ve covered all the major bases. Be creative with your thinking; it’s better to agree on the negatives now than to leave any ambiguity that might create uncertainty later. You may spot some groups or categories of negatives. If so, group together synonyms into clusters, each representing a major theme area that you wish to avoid becoming associated with. To help instil adoption of the new keyword list, it may help to run a fun competition amongst staff to find the most creative ways of using positive keywords. I’ve even seen a tongue-in-cheek Wall of Shame with mugshots of community managers who have accidentally dropped a negative into one of their updates or comments! But most importantly, make using the lists an enjoyable challenge; you’ll be amazed how much fun you can have trying to find ways to dodge the negatives and accentuate the positives. There’s rarely any need for guesswork these days. If you’re writing marketing or sales copy and wondering what’s the best phrase to use, you would be well-advised to consult ‘The Internet’. Free search marketing tools like Google Adwords can give you great insights into the relative appeal of different terms, even highlighting how their usage differs by geography. And simple social web analytics can also give you invaluable clues about the words people use most often, allowing you to mirror their behaviour and capture their attention. For example, if you were writing about fizzy drinks, how does your audience refer to these products? Talking about pop or soda might work, but which is best? This simple study from Edwin Chen sheds some light on the answer. 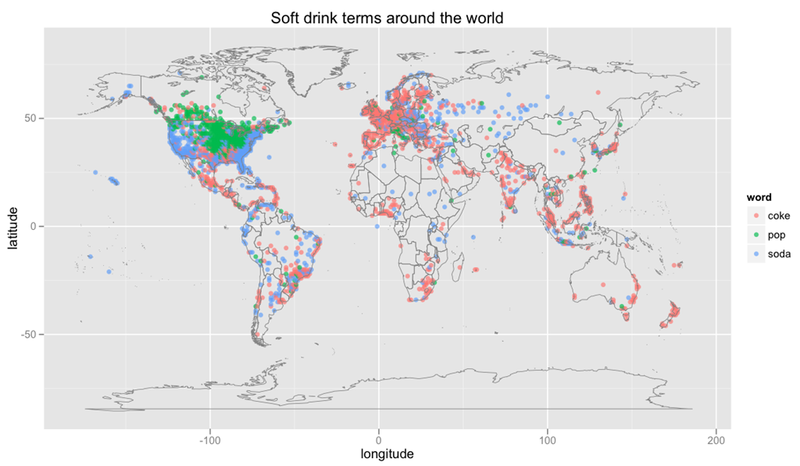 There are vast geographical differences across the globe, as well as within regions in culturally diverse countries like the USA and UK, Interesting stuff. It’s just one example of how mass market intelligence can be used to improve your results. Read Edwin’s report to learn more and let me know what you’re doing to be just as smart. SEOMoz has built a well-earned reputation as the source of expert advice for anyone looking to improve their search engine marketing. While its focus has always laid primarily with SEO (Search Engine Optimisation), the team has never shied away from offering broader advice about using paid ads in search or exploiting other digital channels. But I particularly enjoyed reading this article, brought to my attention by Bruce Lynn, in which President of User Effect, Pete Meyers, implores SEOMoz’s members to get over the demise of SEO and to “start acting like a brand.” And, if a high search engine ranking is important to you, the single best way to achieve this is through establishing a credible social presence for your brand online. It’s not quite time to declare the end of black hat SEO; there will always be people and companies that are prepared to use underhand techniques to gain a slim competitive advantage. But the time has come for every business to recognise the immutable truth that an active social presence online is a far stronger indicator of brand vitality than can be garnered from any amount of behind-the-scenes tweakery. So go on, get social. Your business could depend on it. It doesn’t take Sherlock Holmes to root out the motivation behind Google’s latest research finding that advertisers who stop buying paid ads on Google’s search engine lose lots of search engine clicks. So, in this post I’ll take a look at the research to help you navigate your way through the data. We cannot read any additional data (e.g. click mix between organic and paid listings) because Google’s charts are not drawn to scale and the above 85% actually measures about 66%. Where ad budgets are partially cut (although the research doesn’t specify by what percentage), the lost clicks amount to 80% on average. The biggest problem I have with this study is that it assumes all clicks are equal, effectively ignoring the value of the different click types. If, for example, the 80% of lost clicks arising from a budget cut only contributed 10% of the end actions (e.g. purchase, sign-up, trial etc.) then this might yet prove to be ROI beneficial. We know from prior studies, like Barcelona’s Pompeu Fabra Univertisty’s study in 2010, that search engine users exhibit very different behaviours when confronted by organic and paid ads, and that their propensity to click on either shifts based on their needs. Informational searchers are typically more likely to follow organic listings, while transactional searchers, particularly those in buying mode, are relatively more predisposed to clicking on paid ads. 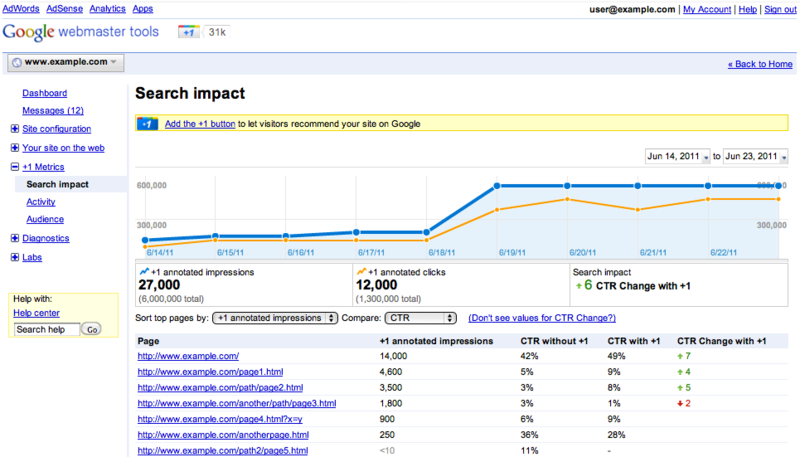 No surprise, again, that buying paid ads leads to a sharp increase in overall click volume. However, this comes at the expense of some lost organic clicks, but we cannot gauge how much from the research because the charts have not been drawn to scale. To accurately assess the true incremental value generated from increasing search ad spend we have to factor in the value of each end action. For examples, if we are seeking informational searchers, who are much more inclined to click organic listings, and by placing additional paid ads we generate fewer organic clicks, the net result may not be positive for our marketing goals. Across the board, our findings are consistent: ads drive a very high proportion of incremental traffic – traffic that is not replaced by navigation from organic listings when the ads are turned off or turned down. It’s hard to disagree with such a generic statement; of course, if you pay for clicks you’ll get more clicks than you might otherwise. But each marketer needs to consider these findings in the light of their unique business challenges. By factoring in the value generated from each type of click, we can make a much more informed judgement about the investment levels needed in search engine advertising to achieve our goals. I regularly listen to The Digital Marketing podcast by Target Internet on my commute to and from work, and recently recorded a guest interview for them which has been released today. I recommend: subscribe to The Digital Marketing podcasts if you’re interested in staying abreast of new developments in digital marketing. Daniel Rowles and Ciaran Rogers share a wealth of knowledge in every episode. Sadly, the most recent episode mostly features me talking nonsense. You can subscribe via iTunes, Zune or other popular podcasting platforms. The RSS feed is here. Please share your feedback in the comments below and let me know of any similar podcasts that you’d recommend for your fellow digital marketers. Much has been written about Google’s recently announced +1 service but now Google has added advanced analytical features that could help prove or disprove the value of this new tool. But first, what is Google +1? At it’s core, +1 is much like Facebook’s ‘Like’ feature. Website owners can add +1 icons like this: to their sites that allow visitors to indicate that they like the page. A counter shows how many other people have clicked the +1 button, thereby giving social proof to boost the perceived value of the web page. Importantly for site owners, these +1 votes are also taken into consideration when presenting search results in Google, so the more clicks you get the greater the chances of people clicking through to your web page. There’s also a social media component to this. Signed-in Google users who click a +1 button leave a trail that shows that they clicked the button. When a signed-in Google user is searching, the Google search result snippet may be annotated with the names of the user’s connections who have +1’d each page. If none of a user’s connections has +1’d a page, the snippet may only display the aggregate number of +1’s the page has received. What’s new? Google has now gone one step further and added new tools to Google Analytics that allow site owners to show exactly what influence (if any) the +1 buttons have on traffic to a site. As the example screenshot below shows, Google will report how many times a +1 count has been annotated to search results, and what clickthrough rates have been achieved with and without these +1 annotations. There’s also an Activity Report that shows how many times selected pages have been +1’d and an Audience Report that shows geographic and demographic data about signed-in Google users who have +1’d pages. These data data points may prove valuable in helping marketers quantify the value of social proof and the impact is has on broader online marketing efforts like search engine marketing and neighbouring display advertising. My advice: Test +1 on selected web pages and see if these analytics tools can help you measure how people interact with your content. With luck you may be able to establish how much influence social proof has on search behaviour. Just don’t expect quick results as Google’s +1 service has far lower penetration and awareness than Facebook’s well-established ‘Like’ feature and may not have a long term future if it stumbles like some previous efforts.